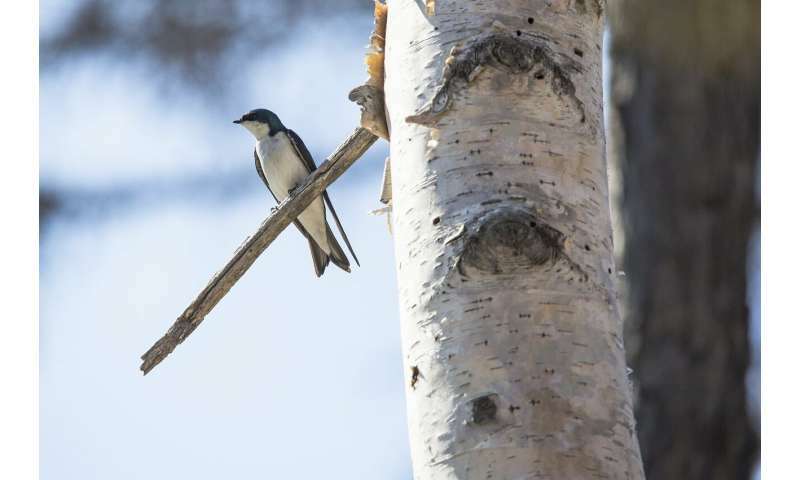 Established in 1975 by Raleigh Robertson at the Queen's University Biological Station (QUBS) north of Kingston, a box-nesting population of tree swallows has provided long-term data sets that a number of Queen's researchers have used. In her most recent study, Dr. Bonier and Cox have determined rainy springs are linked to poor nestling growth in this species. The data shows that from 1977 to 2017, the nestlings' body mass has declined substantially and adult body mass, particularly in males, has also been declining. "We examined 42 years of data and have determined the decline started in the late 1980s," says Cox, who took the lead on the study. "Tree swallows are avian aerial insectivores, which means they eat flying insects. These insects are inactive during cold, wet, or windy conditions which effectively reduces food availability to zero." "This isn't going to affect just one bird species; it's happening with all aerial insectivores, like bats," she says. "These populations are important to the entire food chain and their decline could lead to an insect population explosion, which could be critical in many areas." "I really enjoy working with huge datasets like this one and I'm hoping, with my experience, I can move on to studying other bird species," Cox says. "I'm optimistic this research can contribute to the larger conversation on climate change."